The 6.5 Creedmoor is certainly proving to be popular – it’s the latest attempt by American manufacturers to fill the demand for a .264” (6.5mm) diameter cartridge that can be fired in a short-action rifle. The 6.5 Creedmoor’s case (left) is approx. 115” shorter than the .308 or .243 Winchester (centre & right), and also the same amount shorter than the .260 Rem. Because of its slightly straighter taper and sharper neck angle however, the CM’s powder capacity is very similar. The first 6.5mm cartridge American shooters came to know was the 6.5x55 Swedish, mainly because cheap, excellent quality military surplus rifles in that calibre were imported in large numbers after WWII. But the 6.5 Swede, the .264 Winchester Magnum, and the 6.5 Remington Magnum that followed, all require a medium or longer action. Next came the great 6.5/284, and the very nicely balanced .260 Remington, both first-class target and hunting rounds, that can be squeezed into a short-action rifle, although this involves a certain amount of compromise. Namely, longer, heavier 6.5mm bullets have to be pushed well back into the 6.5/284 and .260 Rem cases to get the rounds to feed properly in short actions, thereby slightly restricting their powder capacity. Next, in 2005 the Europeans jumped on the bandwagon by introducing the 6.5x47 Lapua, a highly effective round specifically designed for competition, that nobody has a negative thing to say about, except that it’s a bit scarce – there aren’t all that many rifles readily available in this neck of the woods that are chambered for the Lapua. Now we have Hornady with a true-blue USA cartridge that ticks all the boxes – the new Creedmoor, originally launched in 2007. Based on the .30T/C case, and shorter (by .115”) than the .260 Remington, the CM has less body taper and a sharper shoulder angle. The 6.5CM fits easily into a short action rifle, and its longer, high BC 6.5mm bullets can be seated well out to meet the lands of the rifling. Having said that however, the practical differences between the Creedmoor, the .260, and the 6.5x47 Lapua are minor. 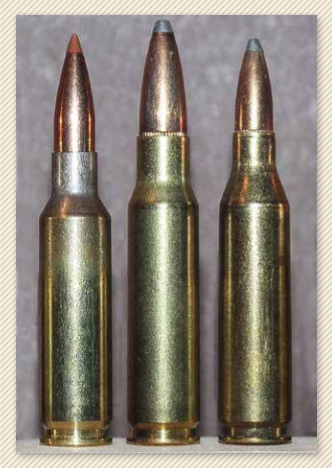 All three will launch a typical high-BC 140 grain 6.5mm bullet at around 2800fps. A deer hit by a hunting bullet from any of the above cartridges is not going to know which one it was fired from. The Creedmoor, the .260 Rem and the 6.5x47 are all mild-recoiling cartridges, which makes them easier to shoot well with when you’re spending a whole day at the range. In contrast the larger-cased 6.5/284 hits harder with up to 200fps greater velocity, but it kicks a bit more and barrel life will be just that much shorter. One definite advantage that the Creedmore does offer however, is that its dimensions make it more suitable for chambering in AR-type rifles than the others mentioned above. With ARs being big sellers in this era, the Creedmoor looks like it will be here to stay. It is doubtful though that in the minds of US hunters it will replace the 7mm/08 in a hurry, which is still regarded by many as the best choice for deer hunting in this country. One of the hottest 6.5s—as in getting a lot of attention these days—is the 6.5 Creedmoor that Hornady designed in 2008. This one is specifically built for F-Class competition and was designed to fit the AR-10 platform. That game is all about supreme accuracy at very long distances. The round is also being chambered in a lot of new bolt-action rifles, such as the new Kimber 84M Hunter and the new Ruger Model 77 FT W.
One thing the 6.5 Creedmoor has going for it is its full-one-caliber-length neck. That feature allows it to be loaded with heavy 6.5mm bullets that have high ballistic coefficients but tend to be long for the caliber. I've built a bunch of Creedmoor loads for hunting and have used them in my Ruger Hawkeye bolt action, and I am convinced that it is a super-effective hunting round even though it was developed originally for target shooting.